I Found It at the Watkinson! As part of an internship in my pursuit of a library science degree, I’ve been cataloging a collection of music from the Watkinson Library. While I’d expected to find interesting items, I was surprised at just how unique many of the materials were, and how intriguing their history proved to be. Connecting some items to an interesting person in history took a little research, such as in the case of items signed by previous owners who turned out to have significant local notability. One item, however, was easily recognizable as truly special at first glance as its history was written out right on the title page. 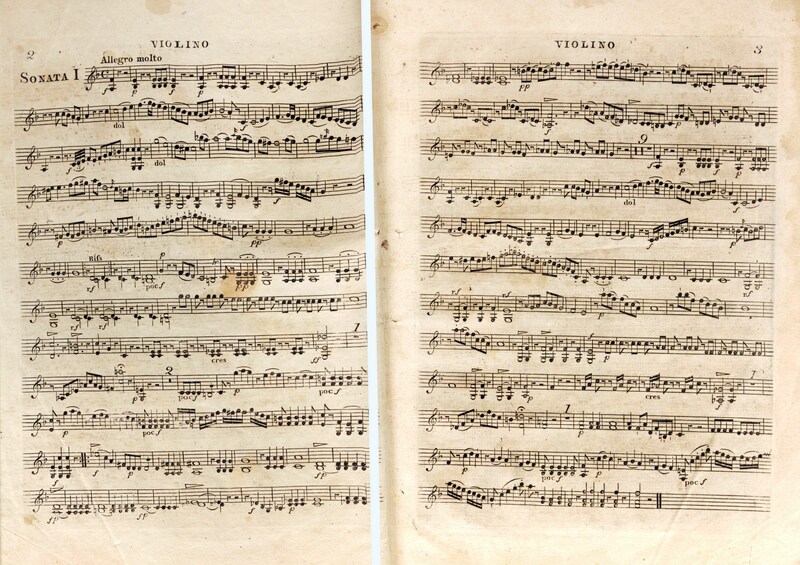 This item was a collection of piano trios by French composer Ignaz Pleyel. While written by a composer who is today lesser known, Pleyel’s music is not necessarily rare or difficult to obtain. 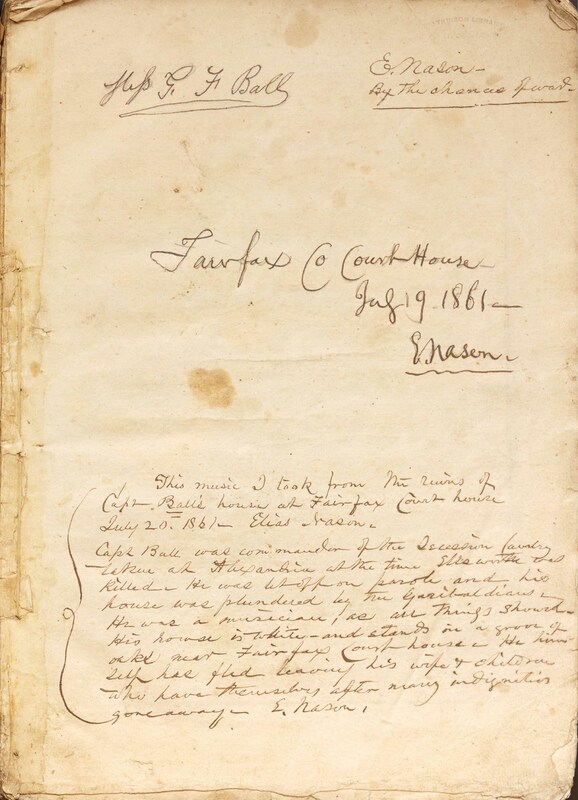 However, this particular copy had a sizeable note dated 1861 and written by Elias Nason, a Massachusetts clergyman and author. 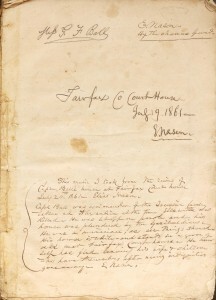 According to the note, Elias obtained the piece in 1861 from the ruins of a house belonging to Confederate cavalry captain Mottrom Dulany Ball. The house had been plundered in the Union takeover of Alexandria, Virginia in April of that year. Nason refers to the plunderers as the “Garibaldians,” who were the 39th New York Infantry Regiment, known as the “Garibaldi guard” as it was comprised primarily of Italian immigrants who had previously fought under Italian revolutionary Giuseppi Garibaldi. Interestingly, Garibaldi himself had been offered a leadership position in the war by Abraham Lincoln, which he turned down as he expected both control of the entire Union army and the outright abolition of slavery as conditions of his joining the war effort. As for Captain Ball, he was captured during the Alexandria campaign and survived the war only to later in life make his greatest contribution to history as the highest ranking US official in Alaska, which was at that time still an unorganized possession of the United States government. He then went on to become Alaska’s first unofficial delegate to the United States Congress, and then Alaska’s United States district attorney. 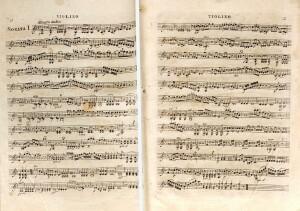 What struck me was not only how diligently the history of this piece of music was recorded, as though Elias Nason knew that in the future this piece would make its way to a library where his note would be read with great interest, but also how this item–which at first glance could be disregarded as mundane–represented a tangential intersection of the lives of such a widely separated group of people: a Union regiment of Italian revolutionaries, a Massachusetts clergyman, and a Virginia-born confederate captain who went on to become one of the founders of Alaskan government. It just goes to prove that it’s not only in movies like “The Red Violin” that you can find a fascinating story of many different people whose lives are all linked together by music. You are currently browsing the I Found It at the Watkinson! blog archives for March, 2012.